Please click on the cover above for information and to buy for your #Nook, #Kindle, #PC or #Mac. Below is your seated exercise for this week. It is very simple and slow. If you have had difficulty with the more complex, faster or demanding exercises in past posts, you might want to go back and start with this one until you become stronger and more familiar with chair exercises. Hope these stretches will work well for you and get you started on the road to better health. Good luck! 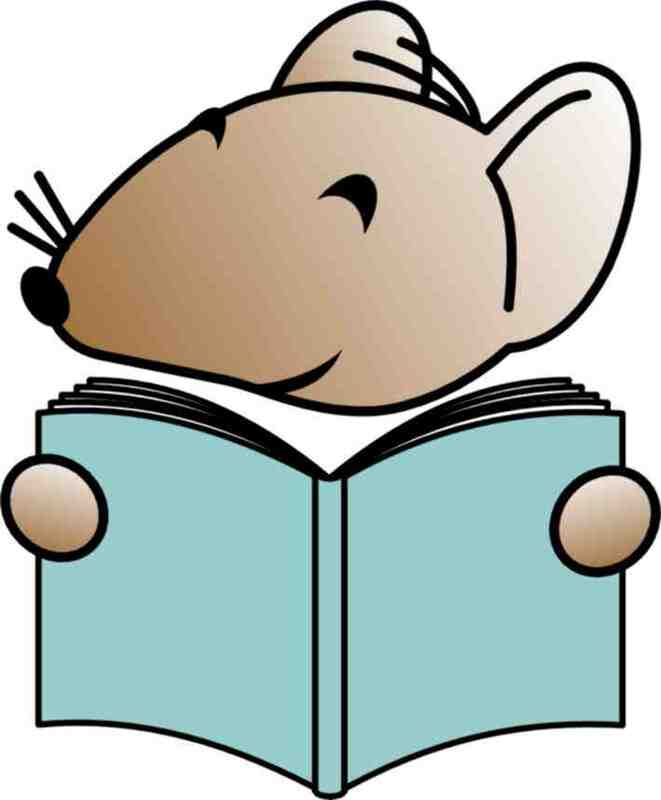 Please click on the book cover above for information and to purchase in print or for your #PC, #Mac, #Nook,or #Kindle. 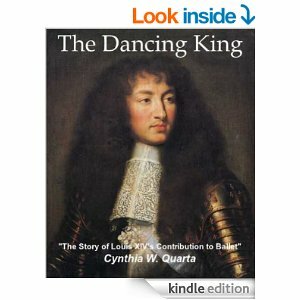 Please click on the book cover above for more information about this book for young dancers, and to purchase. Below is your weekly seated exercise. I hope you will find it useful. Please click on the link below to access your exercise video. Last week we relaxed our necks by gently tilting our heads from side to side. This week we’ll loosen our necks with head drops to the chest and to the back. If you have injured your neck recently or have had surgery on your neck, please consult your physician before you use the following exercise. 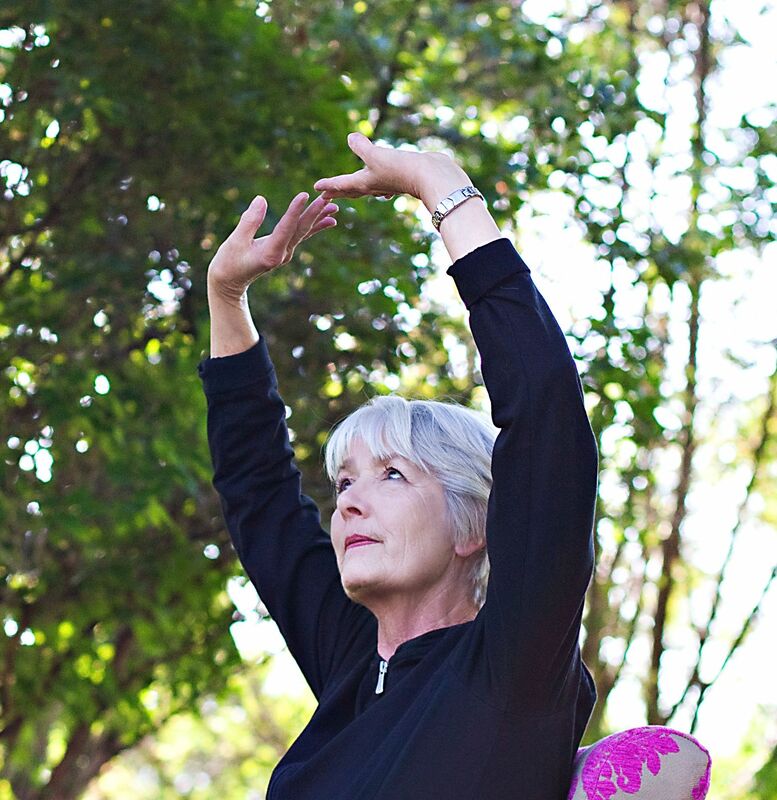 As always, perform the movements slowly and gently with the proper breathing and relaxation. Begin by sitting in a comfortable chair, feet flat on the floor, shoulder-width apart. Lean back against the back of your chair so that your back is fully supported, but sit up as straight as possible without slumping or sitting on your tail bone. Breathe in and out through your nose slowly and thoughtfully, counting your breaths for at least 6 complete breaths before you begin. Breathe in through your nose then lower your head to your chest as you breathe out. Breathe in again and lift your head slowly and carefully back to an upright position. Breathe out again as you allow your head to fall back only as far as is comfortable. Breathe in again as you lift your head back to the upright position. Continue tilting your head to your chest and back for a total of 12 times always breathing in and out with each movement. 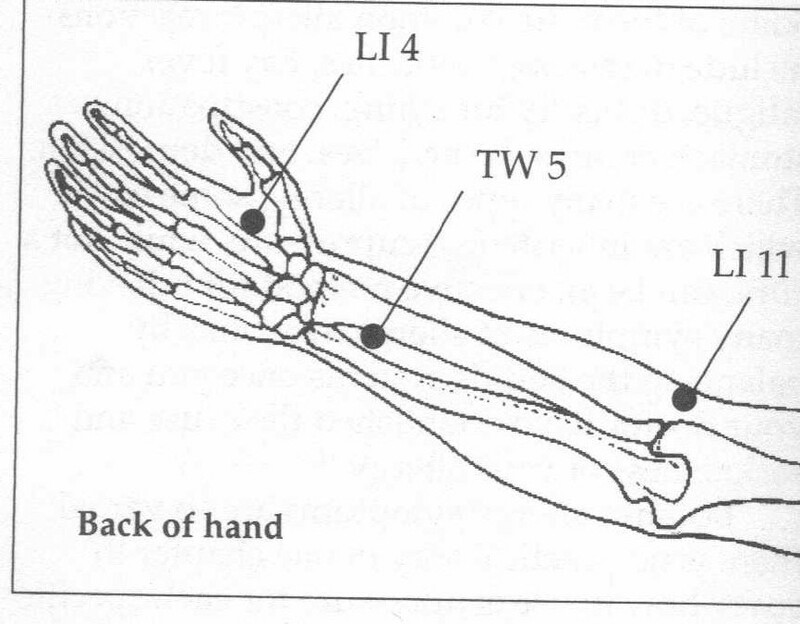 Locate the acupressure point labeled LI 4 on the illustration above from Michael Reed Gach’s book, Acupressure’s Potent Points. 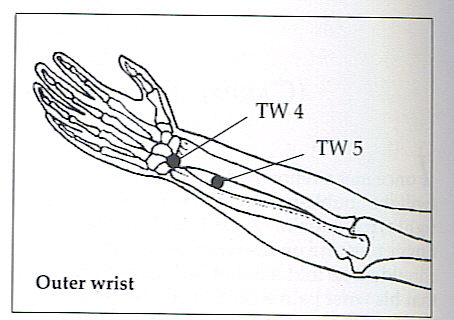 Press on the webbing between your thumb and index finger with your other thumb and gradually increase the pressure underneath the bone attached to your index finger. Continue pressing on this point from one to three minutes. Then, change hands and use this point on your other hand. Daily use of this point will relieve the stiffness and pain of arthritis in your hands, elbows, shoulders and neck. 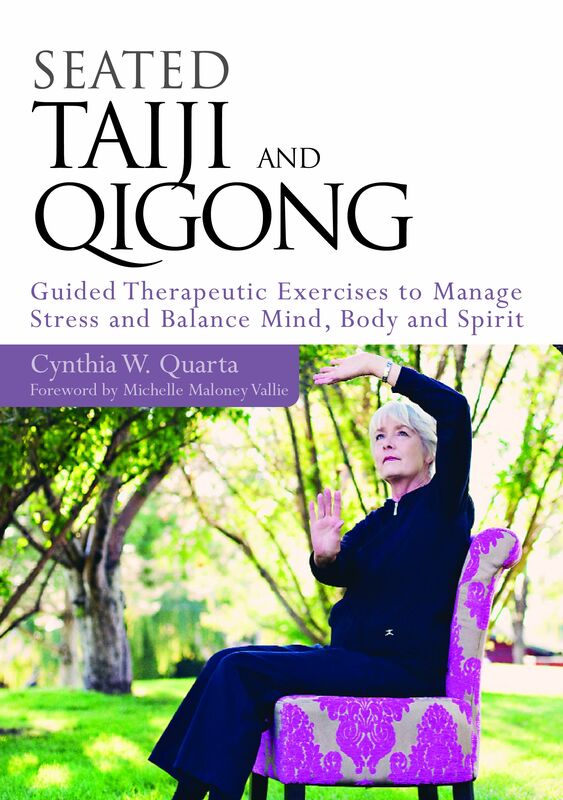 …the award-winning blog of seated Tai Chi and Qigong exercises to inspire health care professionals, caregivers and individuals seeking to balance mind, body and spirit for themselves and others. This is the last post on exercises and acupressure points for nausea and indigestion. My suggestion to you is to bookmark those acupressure points that you have found to be the most effective for you so you don’t need to scroll through all the posts on this subject. Beginning next week, we’ll be learning exercises and acupressure points for arthritis. Begin sitting as usual with your back fully supported by the back of your chair, feet flat on the floor, shoulder-width apart. However, because this point is located on your feet, you may prefer to sit or lie down on your bed or a well carpeted floor when using this particular point. Take 6 slow, thoughtful breaths in and out through your nose conentrating on the movement of those breaths in and through your lungs. 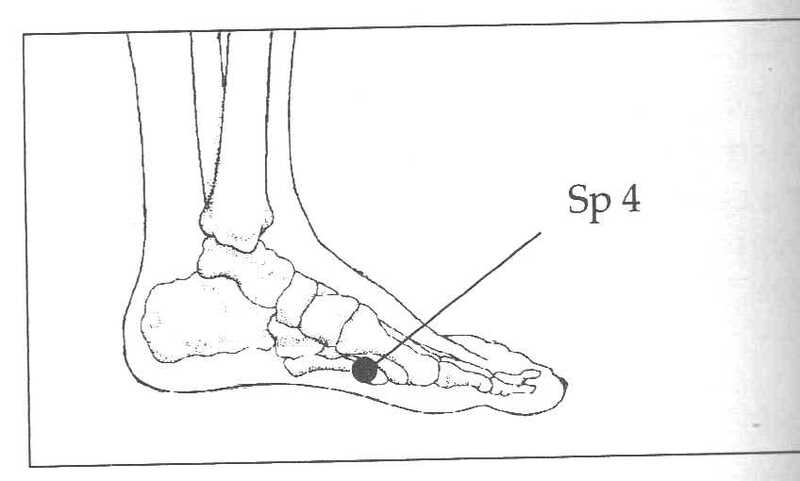 Locate the acupressure point labeled Sp 4 on the illustration below from Michael Reed Gach’s book, Acupressure’s Potent Points. This point is on your arch, one thumb-width from the ball of your foot as you move your fingers toward your heel. Press firmly on this point for at least a full minute. 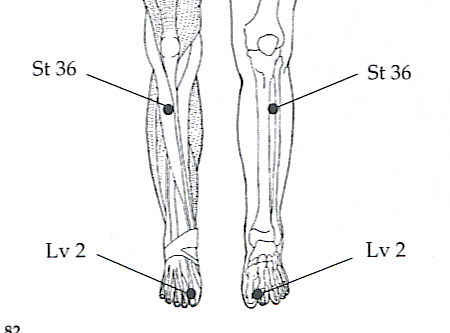 You may change feet and use the point on your other foot for a full minute if you wish. This point is effective for stomachaches, abdominal cramps, indigestion or diarrhea. You may also use this point when you are feeling particularly anxious.